We can imagine Abraham Lincoln delivering his eloquent Gettysburg Address on the battlefield. We can recall the story of his assassination at Ford's Theatre. 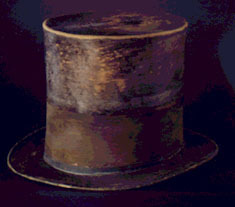 But these stories may seem far removed from us, a trace of our distant past, until we walk into a museum and see his tall stovepipe hat (above). Suddenly, we realize, this man really lived! The sweat from his brow, the hair on his head, and the touch of his fingers all left their marks on this particular piece of clothing. Imagine the stories it could tell as a firsthand witness to events that changed our country forever. Of course, museum collections bring life to our understanding of more subjects than history. To the artist or art enthusiast, no amount of study can replace the experience of seeing in person great works of painting and sculpture. 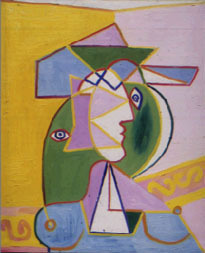 An art student could spend years studying Pablo Picasso's style of cubism by reading theory and looking at pictures of his paintings. For all this work, however, the student's understanding would be incomplete if he never saw the actual paintings. Standing in front of Picasso's Head (below) the observer can detect the subtle hues of color, the curves and lines that lie in the wake of the artist's stroke, the painting's size. He sees the elements of the work  the idea behind it, its colors, its shape  not as part of a description but as something real, something that the artist thought about and created with his own hands. The more a subject involves our senses and perceptions, the more deeply we understand it. The history of space exploration, for example, becomes a human, emotional story when we can examine space suits that were worn by actual astronauts. The Edwin E. "Buzz" Aldrin, Apollo 11 Extra-Vehicular Spacesuit (right) contains many different layers of protection, each one revealing something about what the human body needs to exist in space. The outer shell guards against micrometeorites, fire, and massive temperature swings. The inner layers maintain a safe air pressure level and ventilate the body by providing oxygen and removing carbon dioxide and moisture. What kind of atmosphere requires all of this protection? Would a person feel safe or vulnerable wearing this suit? What kinds of technologies had to exist before such a suit could be created? Real objects and artifacts like this space suit provide factual information as well as stimulate the imagination. The Smithsonian Institution houses these treasures  along with 140 million other objects in its collections. If you consider that each object has stories to tell, then you may understand why the Smithsonian and museums across the country study and interpret history, culture, and science through objects.